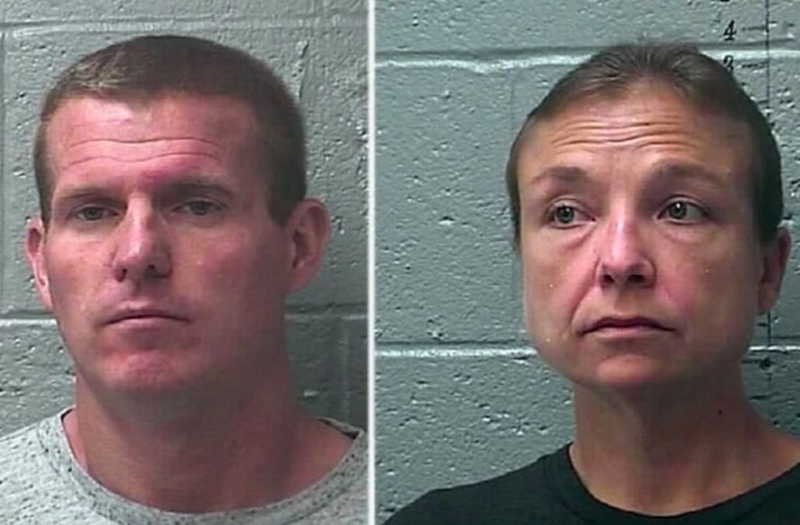 A Missouri couple has been arrested for allegedly keeping four children locked inside small boxes secured with plywood and screws. 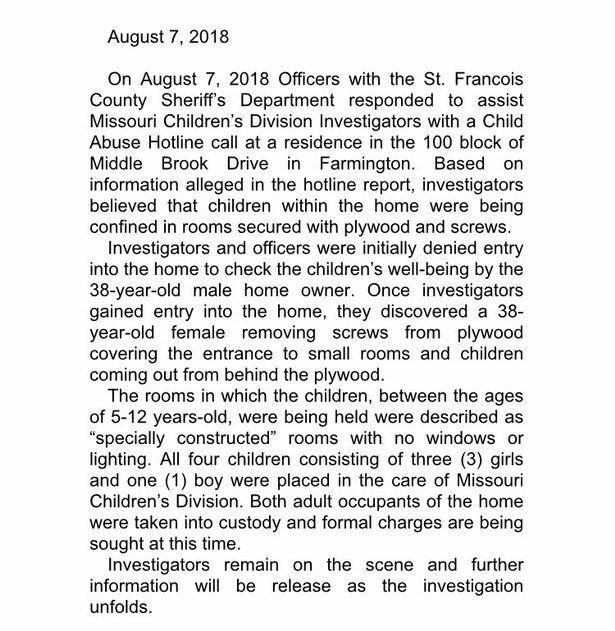 Responding to a tip, deputies with the St. Francois County Sheriff’s Department raided the couple’s Farmington home Tuesday and found the children, ages 6 to 12. Farmington is about 70 miles south of St. Louis. Sheriff Daniel Bullock painted a disturbing picture of child neglect during a Tuesday news conference. He described the children as being held inside homemade boxes in the home. The children had no access to food, water, restrooms, lights or windows, he said. The sheriff called the conditions “deplorable” and said the home reeked of urine. “I’ve seen some pretty nasty things, but nothing this deplorable,” Bullock told reporters. Laura Cheatham and the homeowner, Daryl Head, both 38, were taken into custody on suspicion of eight counts of child endangerment and three counts of second-degree kidnapping. If convicted as charged, the two could face decades in prison, according to St. Francois County Prosecutor Jerrod Mahurin. The case surfaced after an unknown caller contacted a child abuse hotline and authorities went to investigate the tip. When deputies attempted to enter the home, Head initially denied them entry, authorities said. When they managed to enter, Cheatham was seen attempting to unscrew plywood from the boxes. The sheriff said the children, whom he described as three girls and a boy, had been adopted by Cheatham and her ex-husband. Two of the four are related. Investigators suspect the children had been held in the boxes for weeks, authorities said. Tuesday, outside the couple’s Middle Brook Drive home, neighbors said they had no idea the children were allegedly being kept in such horrific conditions. “It does kind of make you feel a little bit bad that’s going on across the street from you and you don’t suspect it,” Stan Souden told KPLR-TV. The children have been placed in protective custody, according to the Missouri Children’s Division. Cheatham and Head are being held in the county jail on $500,000 bail each.